PRODUCT DESCRIPTION: This is a lure to be proud of. 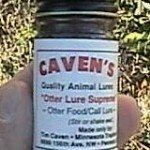 Developed by one off the best, this lure will bring them in. 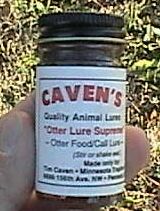 Not only deadly on Otter, it will put a hurting on fox, mink, raccoon and bobcat as well. This seven ingredient secret recipe is aged and tended to for over 15 months before bottling. Your trapline will be very active! RATE OF APPLICATION: Stir and Shake Well, placing just a couple of teaspoons on your set.